Sea kayaking is the ultimate way to just stop and wander. The east coast’s mild climate and calm weather creates prime conditions for kayaking. Paddling the region’s calm seas is an excellent way to experience the coast and observe its abundant bird and marine life. Take a short, guided sea kayaking tour, join a multi-day expedition or hire your own kayak and paddling gear to explore the east coast from the water. Sea kayaking is the ultimate way to just stop and wander. Freycinet is the must-do location for sea kayaking in Tasmania. For novice kayakers, a guided sea kayaking experience is the best option for exploring the east coast from the water. 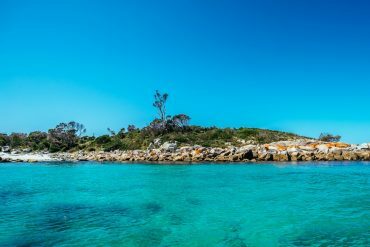 Freycinet Adventures at Coles Bay offers a range of guided sea kayaking experiences. Take a morning or evening to join the award-winning, Freycinet Paddle for an unforgettable way to see Freycinet’s coastline and encounter wildlife—from sea eagles and gulls to little penguins, dolphins and perhaps even a migrating whale. Lonely Planet has named the Twilight Freycinet Paddle one of Tasmania’s top ten outdoor adventures. Already a paddler? If you’re a seasoned kayaker you can elect to bring your own kayak and seek out choice paddling spots along the Great Eastern Drive. Sea kayak rental is available from Freycinet Adventures for groups of two or more experienced paddlers. Kayaking experiences on the east coast range from three-hour guided paddling trips to overnight or multi-day expeditions.